Three acts of intimacy that cross for brief moments, three wishes in the struggle for the realization of a dream, a great country poised between tradition and rupture. Yong Le and Xiao Yun are two young migrants arriving in Beijing and trying to find their way. Lao Jin has a house on worthless land and is now trying to sell it to a hesitant investor. Yong collects furniture from abandoned houses and then resells it. Xiao is a dancer in dingy clubs. Yong’s accident at work, which will deprive him of sight for a few days, will be the spark of the meeting with Lao and Xiao. In the China portrayed by Pengfei(screenwriter of Stray Dogs by Tsai Ming-liang) there is no room for happiness. What the capital city offers to the two young migrants is a dehumanizing treatment: the “underground fragrance” of the title is nothing but the bitter smell absorbed by their skin forced to live in the basement of a tower block. Pengfei was born in a family linked to the Beijing opera scene. His grandfather and his mother both worked in this field: it had a profound influence on him as a consequence and it made him acquire an undeniable attachment to traditional Chinese art and culture. 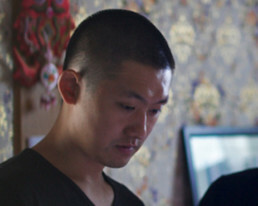 After his diploma in film direction at the “Institut International de l’Image et du Son” in France, he began working from 2008 onwards as assistant director for the Taiwanese filmmaker Tsai Ming-liang. He was assistant director on the film Face (Visage). UNDERGROUNG FRAGRANCE is his first feature film. It received development support from Cinémart Rotterdam, the Torino Filmalb, the Cinereach Award of Sundance Writer Lab and the Cinéfondation of the Cannes Film Festival.